If you're interested in a natural pick-me-up that rivals a morning cup of jo, you've got to try dry brushing. This age-old technique has a litany of health benefits in addition to fighting cellulite. But what really keeps me sticking to it is the way it makes me feel-- I'm invigorated and awake after my morning shower and ready to take on the day plus it makes my skin really soft. I learned about this technique from the book, Gorgeously Green. The tools are simple, all you need is a natural bristle brush with a long handle and your favorite bath wash.
Basically all you are doing is brushing your dry, pre-shower skin with a brush. The goal is to cover all areas and to always brush in the direction of your heart (i.e. from your toes up and from your hands in). Some suggest a 15 minute routine, but for those who are time-crunched in the morning, like me, I can honestly say that just a quick brushing derives great benefits too. If you have more time, great! For the ultimate treat, follow up with this. P.S. For more tips and info, this site is helpful. This gets rid of cellulite?!? 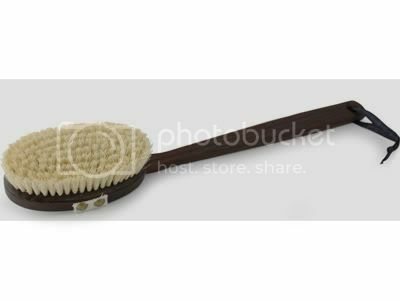 I'm on my way out now to get one of these amazing natural bristle brush! You had me at 'Removes Cellulite', I am off to the store. This is a great idea. I may try it some time. I'm so glad you posted about this. I've been meaning to try it for years. I think you gave me the push to finally buy my brush! I have always wanted to try this. Thanks for sharing!